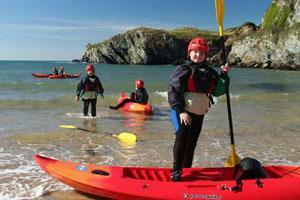 Anglesey Adventures and Coasteering Wales at Anglesey Adventures Outdoor Pursuits CentreAnglesey Adventures is an adventure activity company that provides Adventure Days, and skill based Mountaineering and Climbing courses throughout Snowdonia and North Wales. We pride ourselves on using enthusiastic and experienced local instructors who are there to give you an outing that you will remember for adventure, quality, excitement and enjoyment. Steve Miles, grew up on the beautiful Isle of Anglesey, playing around the Coastline and jumping off rocks! His local knowledge of the marine life and inaccessible cliffs makes for an interesting and exciting time. Our Adventure Days and adventure breaks can be tailored for each group; our courses are aimed at Youth Groups, Stag & Hen Parties, Family and Friends, Schools and Colleges and company's looking for bespoke Team Development Courses. For the intermediate and advanced climber we offer a range of skill based and coaching courses as well as a guiding service. Anglesey Adventures is an adventure activity company that provides Adventure Days, and skill based Mountaineering and Climbing courses throughout Snowdonia and North Wales.